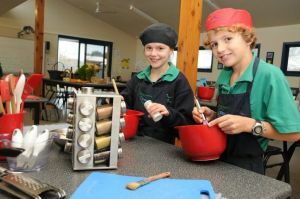 Surfside Primary School students are part of the revolutionary Stephanie Alexander Kitchen Garden Program. The fundamental philosophy that underpins the program is that by setting good examples and engaging children’s curiosity, as well as their energy and their taste buds, we can provide positive and memorable food experiences that will form the basis of positive lifelong eating habits. put literacy skills into practice in the form of recipe reading and writing, reflections and descriptions. The classes greatly benefit from our team of volunteers. They help to facilitate learning, as well as keeping the kitchen and garden environment safe. If you would like to come along and assist, please contact the school for further information. Our volunteers find this to be a thoroughly rewarding experience, often educational, and always full of fun and delicious food!